Today, my boss handed a coworker and me a huge palmful of unwanted pennies. "Who wants it?" he said. Being the poor Midwestern girl I am -- the kind who always checked pay phones and soda machines for neglected change -- I said, "I'll take it!" perhaps two seconds too quickly. He poured the copper coins into my outstretched palms, and I stood immobile with it as we all tried to order lunch. "Is there a Commerce Bank around here?" my coworker asked, presuming I wanted to cash my loot in ASAP. "No," I said. I'm going to take it home and put it in my special elephant bank," I said, somehow forgetting I wasn't five years old and, um, still in the Midwest, looking for somewhere to put my found change. My boss snickered. "It's special because it's an elephant, isn't it?" 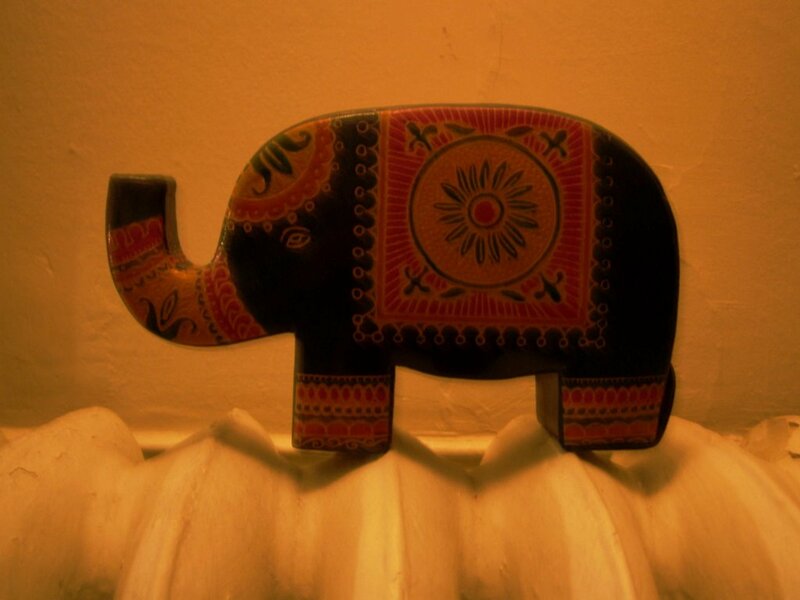 Is it so wrong for a twentysomething woman to love her elephant bank? The Boyf got it for me in O'Hare, en route to the Heartland, where he selflessly volunteered to spend Christmas 2005 with all of my socially awkward relatives. (He's a brave soul.) I knew I loved it when I discovered that you get the money out by opening a special panel with a metal snap on the bottom of his hind feet. For the record, I hate stuffed animals, bows, dolls, and insincere pictures of smiling women who really hate each other's guts on "girls' night." But I think it's okay to have a few childish things around to remind you that the world isn't all corporations, schedules, and bottom lines. My elephant bank is one of those things. My plastic GloWorm is another one -- it came in a Happy Meal around 1989 and sat on my night table for a few years post-college. I wouldn't sell it for anything. Sometimes just knowing it's in one of the boxes under my bed is enough to remind me of my grandparents, the luxury and fun of a Happy Meal before we knew they were that bad for us, and the cheap thrill that comes from recharging a glowing toy in the heat of a 60-watt light bulb.